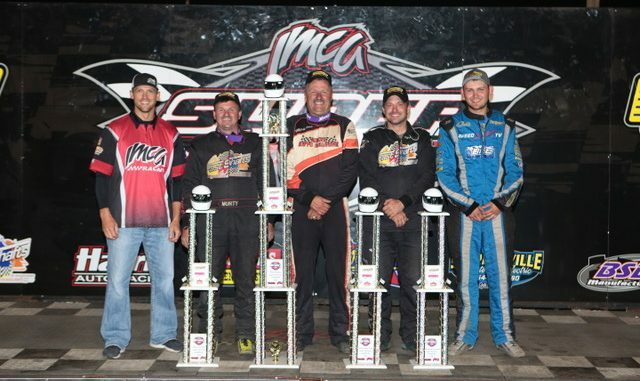 BOONE, Iowa (Sept. 8) – A driver who’s made plenty of history at the IMCA Speedway Motors Super Nationals fueled by Casey’s made even more Saturday night. Jeff Aikey, a six-time Late Model champion at America’s Racin’ Vacation, started on the pole and led all 40 laps of the Modified main event at Boone Speedway. He’s the fourth driver to win Super Nationals crowns in multiple divisions and just the second to earn Late Model and Modified titles, joining Kevin Pittman in that accomplishment. His total of seven championships is a Super Nationals record. Only two cautions came out over the course of the 40-lapper and Aikey pulled away after restarts on the second and eighth circuits. Ryan Ruter ran second much of the distance before giving way to Cayden Carter with four laps left. Six lapped cars separated Aikey and Carter at the checkers. Ethan Dotson started 13th and com­pleted the top four. Aikey’s win was good for $5,900, $2,000 plus $100 for each of 39 sanctioned starts this season, and put him on the Fast Shafts All-Star Invitational ballot for 2019. He’d won Super Nationals Late Model main events in 1995, 2004 and 2013-2016. Pittman topped the Modifieds in 1989 and the Late Models two years later. A dozen different states were represented in Saturday’s big show. Grey Ferrando and Collen Winebarger were the first-ever qualifiers from Oregon and finished 16th and 21st, respectively. Aikey was also among the 17 first-time qualifiers in the 33-car field. First-time champions at the 36th annual Super Nationals were Damon Murty in the Stock Cars and Jake McBirnie in the Northern SportMods while Shannon Anderson ruled the Hobby Stocks for the fifth time. Murty brought more than 250 IMCA career wins and three runner-up finishes at Super Nationals into the big dance. He passed Kyle Strickler on the fourth circuit and started stretching his lead following back-to-back cautions at midway. Kyle Vanover had the edge for second when lap 18 was scored. The final caution came with two to go but there was no catching Murty before the $2,950 checkers flew. Vanover, Todd Reitzler and 12th starting Abe Huls were next across the stripe. McBirnie ran second much of the Northern SportMod main, using a lap 20 restart to take the lead away from Doug Smith. He’d stay strong following a couple late restarts to earn the $2,100 win in front of 13th starting Joe Docekal, Smith and Austin Luellen. Anderson was quickly in front of the Hobby Stock field from his seventh starting spot and led every lap despite the best efforts of Corey Madden. The front pair pulled away from the pack with Anderson getting the win, and $1,575 paycheck, by four car lengths. Hard charger Eric Stanton made his way from 27th starting to third and Zach Olmstead was fourth. Jason Wolla won the Harris Auto Racing Race of Champions for Modifieds, John Oliver Jr. the Sunoco Race Fuels Race of Champions for Stock Cars, Colby Fett the BSB Manufacturing Race of Champions for Northern SportMods and Madden the Stephenville Starter Race of Champi­ons for Hobby Stocks. Hunter Marriott won the Friday night Fast Shafts All-Star Invitational for Modifieds. Modifieds – 1. Jeff Aikey, Cedar Falls; 2. Cayden Carter, Okaloosa; 3. Ryan Ruter, Kanawha; 4. Ethan Dotson, Bakersfield, Calif.; 5. Jason Wolla, Ray, N.D.; 6. Drew Armstrong, Alexander, Ark. ; 7. Josh Long, Little Suamico, Wis.; 8. Cody Laney, Torrance, Calif.; 9. Riley Simmons, Susanville, Calif.; 10. Jay Noteboom, Hinton; 11. Justin Auringer, Evansdale; 12. Clint Luellen, Minburn; 13. Nick Deal, Harlan; 14. Anthony Roth, Columbus, Neb. ; 15. Tim Ward, Chandler, Ariz.; 16. Grey Ferrando, Stayton, Ore.; 17. Tanner Black, Otis, Kan.; 18. Nick Roberts, Des Moines; 19. Tyler Frye, Belleville, Kan.; 20. Troy Foulger, Oakley, Cal. ; 21. Collen Winebarger, Corbett, Ore.; 22. Chaz Baca, Mesa, Ariz.; 23. Scott Drake, Diamond, Mo. ; 24. Jordy Nelson, Marysville, Kan.; 25. Kyle Brown, Madrid; 26. Peyton Taylor, Batesville, Ark. ; 27. Joe Duvall, Claremore, Okla.; 28. Jimmy Gustin, Marshalltown; 29. Tyler Sutton, Beloit, Kan.; 30. Kelly Shryock, Fertile; 31. Hunter Marriott, Brookfield, Mo. ; 32. Mitchell Hunt, Greenville, Mich.; 33. Steven Bowers Jr., Topeka, Kan.
Stock Cars – 1. Damon Murty, Chelsea; 2. Kyle Vanover, Beatrice, Neb. ; 3. Todd Reitzler, Grinnell; 4. Abe Huls, Carthage, Ill.; 5. Devin Smith, Lake City; 6. Shawn Wagner, Lena, Wis.; 7. Randy Brands, Boyden; 8. Luke Lemmens, Madison, Wis.; 9. Jay Schmidt, Tama; 10. Kyle Strickler, Troutman, N.C.; 11. Dean Abbey, Roanoke, Texas; 12. Johnny Spaw, Cedar Rapids; 13. Elijah Zevenbergen, Ocheyedan; 14. Jeff Tubbs, Colby, Kan.; 15. Justin Temeyer, Independence; 16. Jason See, Albia; 17. Aaron Stolp, Suamico, Wis.; 18. Jeremy Christians, Horicon, Wis.; 19. Tanner Pettitt, Norfolk, Neb. ; 20. Derek Green, Granada, Minn.; 21. David Smith, Lake City; 22. Kyle Frederick, Oconto Falls, Wis.; 23. Kevin Opheim, Mason City; 24. Brandon Czarapata, Pulaski, Wis.; 25. Jeff Mueller, Albion; 26. Norman Chesmore, Rowley; 27. Troy Jerovetz, Webster City; 28. Travis Barker, Sioux City; 29. John Oliver Jr., Danville; 30. Donavon Smith, Lake City. Northern SportMods – 1. Jake McBirnie, Boone; 2. Joe Docekal, Dysart; 3. Doug Smith, Lake City; 4. Austin Luellen, Minburn; 5. Chase Rudolf, Norwalk; 6. Anthony Kobus, David City, Neb. ; 7. Cody Thompson, Sioux City; 8. Chad Ryerson, Wellsburg; 9. Daniel Fellows, Keokuk; 10. Ethan Braaksma, Newton; 11. Brayton Carter, Oskaloosa; 12. Ben Chapman, Clarence; 13. J.J. Baumli, Lathrop, Mo. ; 14. Brandon Dale, Arbela, Mo. ; 15. Timothy Warner, Malone, Wis.; 16. Dustin Lynch, Boone; 17. Rusty Montagne, North Sioux City, S.D. ; 18. Reese Coffee, Hinton; 19. Gunnar Pike, South Bend, Neb. ; 20. Chad Briese, Albion, Neb. ; 21. Jarred Hackler, Juniata, Neb. ; 22. Ty Rogers, Somerton, Ariz.; 23. Sean Manning, Bennington, Neb. ; 24. Arie Schouten, Blair, Neb. ; 25. Cory Rose, Boone; 26. Johnathon Logue, Logansport; 27. Alec Fett, Thompson; 28. Doug Cook, Algona; 29. Lucas Lamberies, Clintonville, Wis.; 30. 30. Cody Schroeder, Manitowoc, Wis.
Hobby Stocks – 1. Shannon Anderson, New Virginia; 2. Corey Madden, Avoca; 3. Eric Stanton, Carlisle; 4. Zach Olmstead, Overton, Neb. ; 5. Jeff Ware, Columbus, Neb. ; 6. John Watson, Des Moines; 7. Benji Irvine, Oelwein; 8. Drew Barglof, Sioux Rapids; 9. Matthew McAtee, Elkhart; 10. Brandon Cox, Norwalk; 11. Brett Vanous, Quasqueton; 12. Jesse Vanlaningham, Beatrice, Neb. ; 13. Jason Kohl, Missouri Valley; 14. Justin Wacha, Vinton; 15. James Johnson, Cherokee; 16. Eric Gillette, Slayton, Minn.; 17. Craig Clift, Sioux City; 18. Bob Daniels, Des Moines; 19. Kyle Parizek, Hartwick; 20. Dawson DeBoer, Little Rock; 21. Andrew Claus, Spencer; 22. Wes Jahnz, St. James, Minn.; 23. Zac Smith, Mason City; 24. Brandon Nielsen, Spencer; 25. Andrew Burg, Carlisle; 26. Adam Ayers, Adair; 27. Gary Pesicka, Burt; 28. Tathan Burkhart, Hays, Kan.; 29. Tyson Overton, Carlisle; 30. Andy Hoffman, Sioux City. Harris Auto Racing Modified Race of Champions – 1. Jason Wolla, Ray, N.D.; 2. Jimmy Gustin, Marshalltown; 3. Steven Bowers Jr. Topeka, Kan.; 4. Tyler Frye, Belleville, Kan.; 5. Todd Shute, Norwalk; 6. Chaz Baca, Mesa, Ariz.; 7. Drew Armstrong, Alexander, Ark. ; 8. Chris Elliott, Abilene, Texas; 9. Anthony Roth, Columbus, Neb. ; 10. Regan Tafoya, Farmington, N.M.; 11. Scott Hogan, Vinton; 12. Kody Scholpp, Estevan, Sask. Sunoco Race Fuels Stock Car Race Of Champions – 1. John Oliver Jr., Danville; 2. Elijah Zevenbergen, Ocheyedan; 3. Jeff Tubbs, Colby, Kan.; 4. Dustin Larson, Rushmore, Minn.; 5. Norman Chesmore, Rowley; 6. Jeremy Christians, Horicon, Wis.; 7. Shane Stutzman, Milford, Neb. ; 8. Jesse Taylor, Fort Morgan, Colo.; 9. Scott Davis, Madrid; 10. Justin Nehring, Storm Lake; 11. Devin Smith, Lake City; 12. Jay Schmidt, Tama. BSB Manufacturing Northern SportMod Race of Champions – 1. Colby Fett, Algona; 2. Doug Smith, Lake City; 3. Robby Rosselli, Minot, N.D.; 4. Steve Clancy, Odessa, Mo. ; 5. Johnathon Logue, Logansport; 6. Austin Luellen, Minburn; 7. Adam Birck, Canton, Mo. ; 8. Brandon Dale, Arbela, Mo. ; 9. Tony Rialson, Cottonwood, Mo. ; 10. Rusty Montagne, North Sioux City, S.D. ; 11. Brett Meyer, Lytton; 12. Ethan Braaksma, Newton. Stephenville Starter Hobby Stock Race of Champions – 1. Corey Madden, Avoca; 2. Chanse Hollatz, Clear Lake; 3. Aaron Rudolph, Grand Junction; 4. Zach Olmstead, Overton, Neb. ; 5. Tathan Burkhart, Hays, Kan.; 6. Brandon Cox, Norwalk; 7. Brett Vanous, Quasqueton; 8. David Rieks, Eldora; 9. Brandon Nielsen, Spencer; 10. Tanner Jones, Ogallala, Neb. ; 11. Jeff Ware, Columbus, Neb. ; 12. Cody Williams, Minneapolis, Kan.
Fast Shafts All-Star Invitational – 1. Hunter Marriott, Brookfield, Mo. ; 2. Richie Gustin, Gilman; 3. Kelly Shryock, Fertile; 4. Ethan Dotson, Bakersfield, Calif.; 5. Chris Abelson, Sioux City; 6. Tim Ward, Chandler, Ariz.; 7. Cayden Carter, Oskaloosa; 8. Kody Scholpp, Estevan, Sask. ; 9. Troy Foulger, Oakley, Calif.; 10. A.J. Ward, Ionia, Mich.; 11. Tyler Frye, Belleville, Kan.; 12. Steven Bowers Jr., Topeka, Kan.; 13. Kevin Sustaire, Emory, Texas; 14. Scott Hogan, Vinton; 15. Joel Rust, Grundy Center; 16. Chaz Baca, Mesa, Ariz.; 17. Chris Elliott, Abilene, Texas; 18. Austin Wonch, Crystal, Mich.; 19. Zachary Madrid, Phoenix, Ariz.; 20. Will Ward, Cobleskill, N.Y.; 21. Jason Wolla, Ray, N.D.; 22. Brandon Beckendorf, Danube, Minn.; 23. Clint Luellen, Minburn; 24. Kyle Brown, Madrid; 25. Cory Sample, Winnemucca, Nev.; 26. William Gould, Calera, Okla.; 27. Shane Hiatt, Rising City, Neb. ; 28. Jay Noteboom, Hinton; 29. Cody Laney, Torrance, Calif.; 30. Kyle Strickler, Troutman, N.C.